I’m not a doll fan, had a few small ones as a child but most dolls with their vacant stares or beady eyes appeared a bit freaky to me. Call me a geek, but I veered toward rock collecting and Dr. Seuss books. So, I didn’t know what to expect entering the Lois Lofton Doll Museum in Deridder. Lois Lofton collected hundreds and hundreds of dolls in her lifetime, leaving the more than 3000-piece collection she assembled from all over the world to the city of Deridder when she passed. This massive collection is on display from 9 a.m. to 5 p.m. weekdays at the Beauregard Tourist Commission office, 313 W. First St. in the heart of the city. I was visiting the tourist office to gain admission to the gothic jail next door, the city’s ancient jail known for its unusual architecture — and ghosts. But we spotted the dolls down the hall and our gracious tourism staff member invited us to check it out. 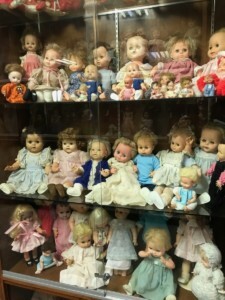 There are several rooms with large display cases filled with dolls of all kinds, from porcelain dolls from the 19th century to the more modern Elmo and Cabbage Patch Dolls. There’s a huge display of Barbies and Kens, ethnic dolls of all kinds, cartoon dolls such as Peanuts characters and dolls that were products of commercials, such as the Keebler Elf. There’s Santa Claus, Peewee Herman and Ernest P. Worrell (remember him?). Remember how I said I wasn’t a fan? I mentioned those small dolls I had as a child and our guide pointed out the Liddle Kiddles that Lofton had collection, tiny Mattel dolls that came in cologne bottles and rode tiny bicycles and other accessories. Then I spotted the Pebbles doll, the exact replica of one I adored as a child. Needless to say, the tears welled up. 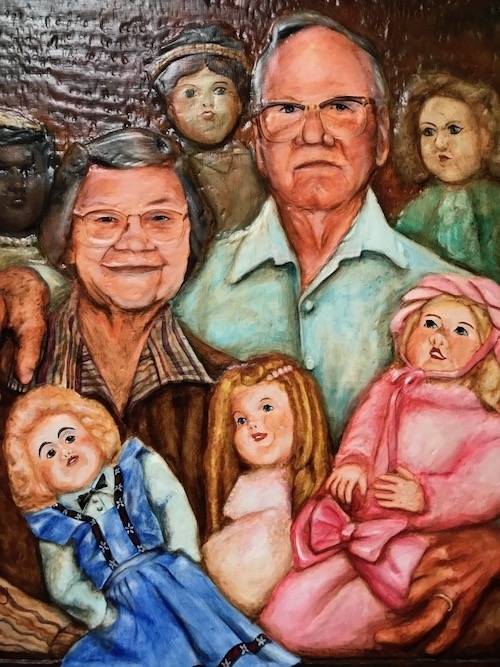 Lois Lofton and her husband Albert spent their lifetime collecting these dolls and at the entrance to the museum is a bas relief portrait of the couple in wood by local artist Court Bailey. Be sure to pause and offer thanks for the fun trip back in time.